Wow, pretty unexpected. Totally did not see that coming. Monster yes, the eyes no. There is a reason for the eyes. Our son was the one who wanted us to do a sea serpent and we let him do the basic design. That is what he came up with the eye stalks. There is a reason for the eyes. Our son was the one who wanted us to do a sea serpent and we let him do the basic design. That is what he came up with…. hence the eye stalks. Dude, how much are you willing to bet that thing ate Princess? And that’s why, even though they know they’re really close to the beacon, they can’t see any possible place where Princess could be? 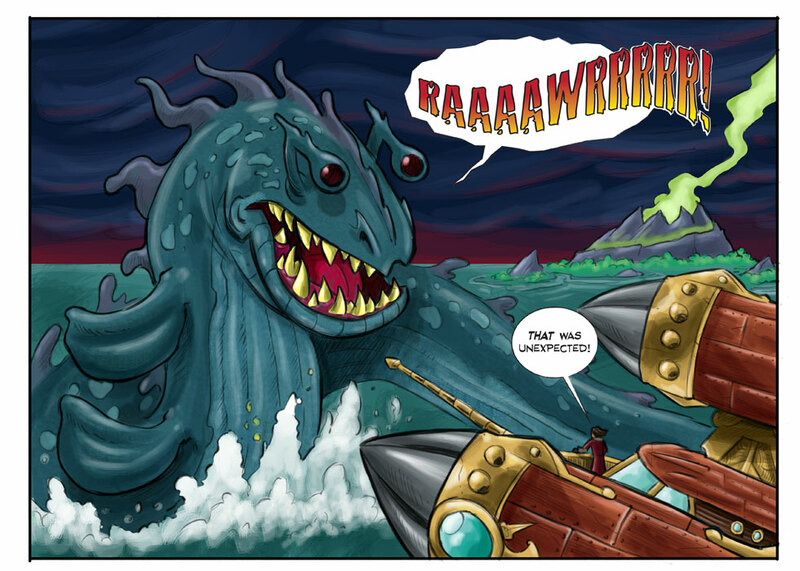 That, or the sea monster is the princess! I can see why they refused to replace her, a monster that impressive isn’t one to simply replace! The monster looks great with the eye stalks. Your son did a good job designing it. Now the question is: Is that or is it not Princess? I disagree. They are completely impractical for a supposedly predatory creature (judging by its teeth). Then again, we can’t be totally sure. One other interesting distinction between fiction and reality is the tendency for predators to be depicted roaring at prey, when in reality such shows serve precisely the opposite purpose (i.e. trying to intimidate the target into leaving). Right now we only have 2 pages a week. Our goal is to do 3. They are always on Mon. and Thurs. Usually later in the evening, but could go up earlier. Those are the 2 days to watch for updates. your son make the design?……awwww CUTE!